If you find yourself creating lots of tickets with the same basic attributes, use ticket templates to fill them in next time with a single click. 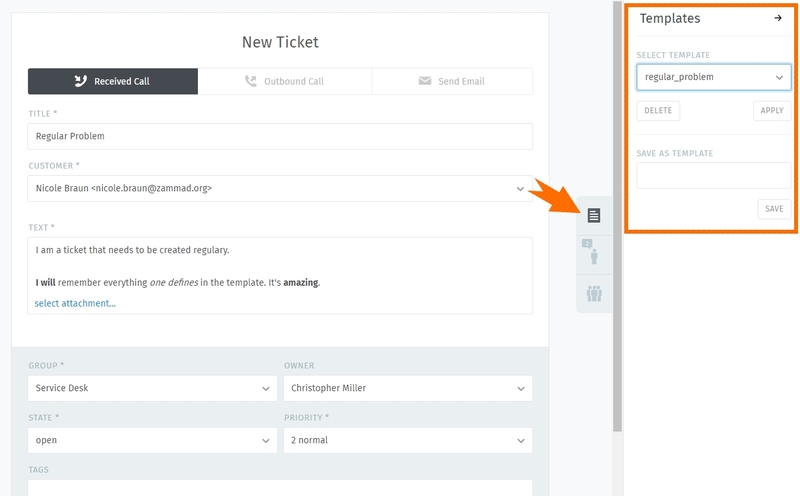 Use the ticket pane to load or create ticket templates. To create a new template, start by filling in a new ticket as usual. Then, instead of submitting the ticket form, use the template dialog in the ticket pane to enter a name for your new template, and click “Save”. The next time you create a ticket, you’ll find your new template in the “Select template” dropdown. Click it to apply your saved attributes to the new ticket. Any template created by any agent will be available to all agents.